See this lady in the hat? That's my mom. She's loved hats...for as far as I can remember. In the mid-1980s, when hats were an "optional" accessory, she had a chapeau to match every church dress. I can remember a particular black hat that she wore with an emerald green dress. I wanted to be her so badly, so I could wear the hat. Unfortunately, I'm not a hat person - I think that gene skipped a generation, and Celia has it. The difference is in that first picture, Mom's hat is a not-so-optional accessory. In this picture, she was finally well enough to go on a Girl's Day Out with Celia and me, but the hat hides the post-chemo fuzz. She's survived cancer twice, including breast cancer. October is Breast Cancer Awareness Month. I desperately want to see breast cancer gone - I never want to see my daughter wearing a hat because her head is bald from cancer treatment. 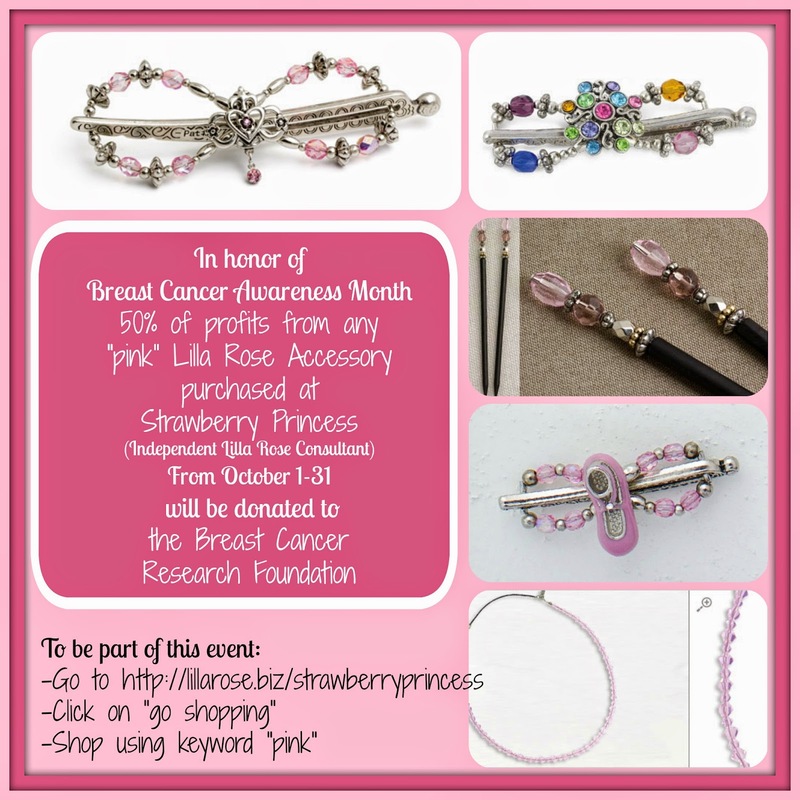 To help make that happen, Strawberry Princess (Independent Lilla Rose Consultant) is hosting a fundraiser from October 1-31, 2014. It will benefit Breast Cancer Research Foundation, a non-profit organization that funds cancer research. Over 91% of funds raised by Breast Cancer Research Foundation go to medical research to eradicate breast cancer. Shop through midnight PST on October 31. Shop using the keyword "pink"
It's that easy! 50% of the profit from your purchase of any Flexi, Headband, or Hairstick listed under the keyword "pink" will be donated to BRCF. Let's all wear Lilla Rose hair accessories now, so women will not "have to" wear hats later! Disclaimer: This post contains affiliate links. See here for details.